This site is under construction, please check back often for updates. This is the home of Elizabeth Eells; Graphic Designer and Photographer of ElizDesigns and ElizWeddings and have been in business since 2008 on the internet. ElizDesigns features many products, collections and sets for many different occasions which appeal to women, men and children of all ages that can be customized by you. Click on the desired category to see beautiful designs from which to choose. Once you see a design you are interested in, click on it and you will see an enlarged version. ElizWeddings features many wedding sets and gifts that can be customized by you. 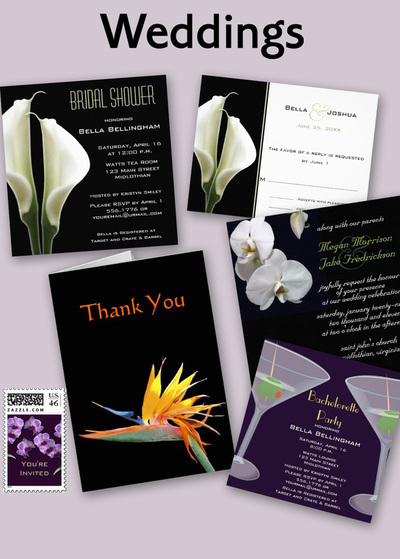 There are many beautiful wedding designs from which to choose. Once you see a design you are interested in, click on it and you will see an enlarged version.